I went into work one day this past week and overheard one colleague squeal to another, “Did you see? Asparagus at the Greenmarket today!” Truth be told, I hadn’t realized that was a new thing. I, somewhat obliviously, picked up a bunch for $4 at the Grand Army Plaza Greenmarket last weekend. Asparagus was everywhere, at nearly every stand; I just figured it’d been around for a couple of weeks at least. I wanted to eat it raw and crunchy, although I do also love it roasted with garlic and dressed with lemon and parmesan. 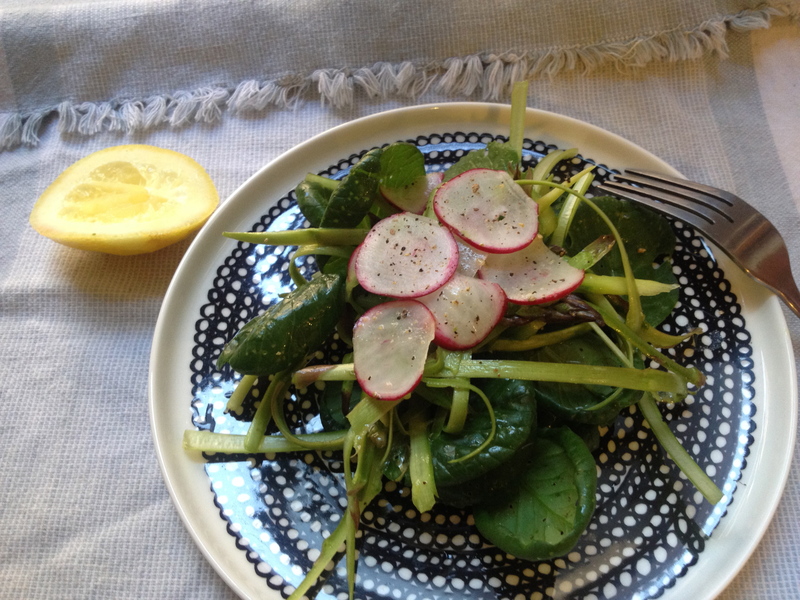 Also check out my friend Valerie’s recent post on green asparagus salad with parmesan. At the market, the radishes were calling to me too so I grabbed a bunch of those for $2 and a 1/4 pound of bright green tatsoi for $3 and headed home to make lunch. 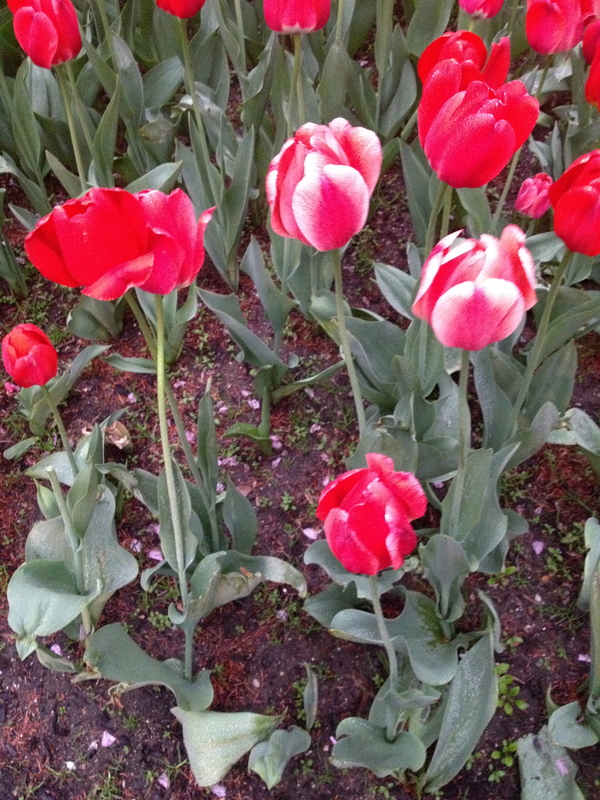 Take advantage of the season, carpe diem, get to your local farmer’s market and see what calls to you. It may be tatsoi, it may be ramps, it may be an apple cider donut. Speaking of ramps, you can check out my recipes from past years for an omelette with ramps and feta, and ramp butter. Cut off the tough bottoms of the asparagus spears and discard (usually the bottom one inch or so). Chop the top part of the spear and slice in half or thirds, setting aside. Using a vegetable peeler slice the remaining asparagus spears lengthwise. 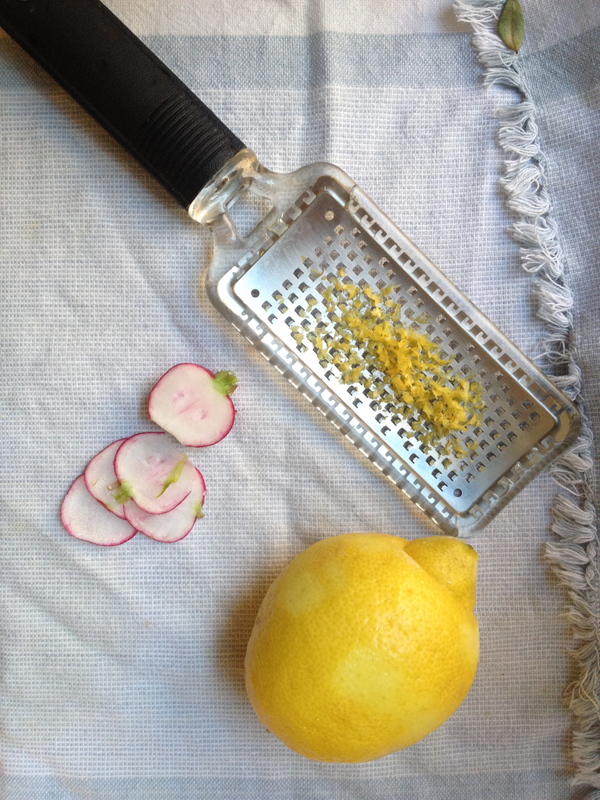 Slice the radishes very thinly. You can either do this with a paring knife or the vegetable peeler. Combine in a bowl with the asparagus tops and sliced spears. In a small mason jar or measuring cup, combine the lemon juice, zest, olive oil, salt, and pepper, adjusting proportions to your liking. I would use something like 2 tbsp olive oil, 1 tbsp lemon juice, a big pinch of salt and a few cranks of freshly ground pepper. Shake (or whisk with a fork). 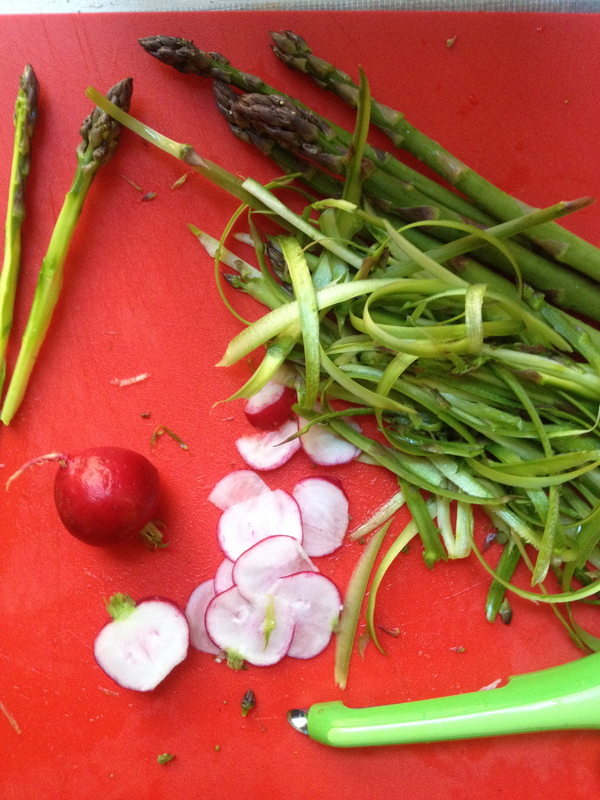 Toss the dressing with the asparagus and radishes, then add your greens, combining a little more. Plate the salad, adding a few more thin slices of radish on top, and maybe a little more salt and pepper. Serve.